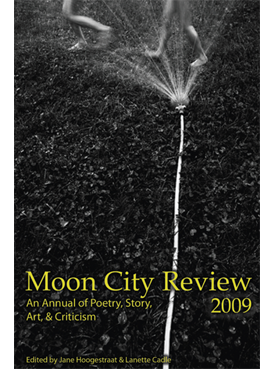 Moon City Review 2009 is a newly established book annual intermingling poetry, story (both fiction and creative nonfiction), visual art, and timely cultural and literary criticism. Featuring the invited work of nationally renowned authors, MCR also provides a venue for upcoming authors and artists. MCR 2009 includes poetry and fiction by Burton Raffel; poetry by Ted Kooser, Miller Williams, Marcus Cafagña, and Michael Burns; fiction (and an interview) by Kevin Brockmeier; short fiction by John Dufresne and Michael Cyzniejewski; and criticism by Billy Clem. A special section, “Archival Treasures,” features original and unknown work by Rose O’Neill, arguably the Ozarks’ most famous graphic artist. Jane Hoogestraat is professor of English at Missouri State University. Lanette Cadle is assistant professor of English at Missouri State University. Julie Blackmon’s award-winning photographs have graced the pages of The New Yorker, Vanity Fair, Oxford American, and National Geographic.